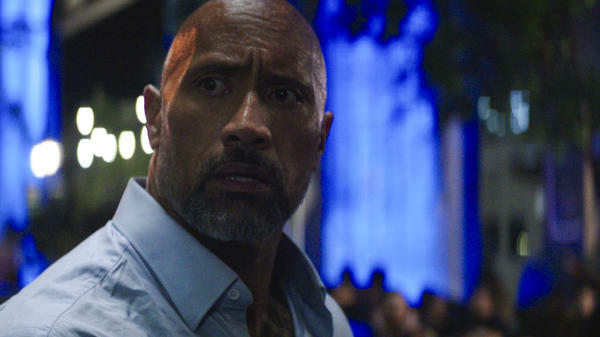 Dwayne Johnson (sometimes known as Dwayne "The Rock" Johnson) plays Will Sawyer in Skyscraper, a movie where The Rock fights a skyscraper. Well, sort of. Permit me this short review of Skyscraper, starring Dwayne Johnson, not currently billed as Dwayne "The Rock" Johnson: If you think there is any chance you will enjoy Skyscraper, you will. If you think there is very little chance you will enjoy Skyscraper, you will not. The most important thing to know about the plot of this often delightful nonsense is that the movie has a plot, nominally speaking. Action Dad Will Sawyer (Johnson) is a security systems consultant who comes to Hong Kong to inspect a new skyscraper (GET IT?). Owned by Zhao Long Ji (Chin Han), it's a record-breaking piece of architecture from what one supposes is the near-future Phallic Period, topped by a magical and mysterious sphere. Sawyer brings his family — wife Sarah (Neve Campbell) and twins Georgia (McKenna Roberts) and Henry (Noah Cottrell) — along so that they can be imperiled for story reasons. Unfortunately, this trip was arranged by a friend of Will's played by Pablo Schreiber, and if you don't know that means trouble is a-comin', you haven't seen Pablo Schreiber in anything recently. Blah blah blah, evil machinations ensue, and it doesn't take long to reach our true beginning point: Will is away from the building when his family becomes trapped a few floors above a fire. The bad guys are in the building too, and Will needs to rescue his family from the giant burning tower. Remember how, for a while, everything was "Die Hard in a [blank]"? In a bus, in a plane, on a boat? Well, this is kind of like Die Hard in a tall building. If you think that sounds a lot like ... just regular Die Hard, then you are not wrong, although there's a longer history, going back to The Towering Inferno, that is probably as old as the fear of being stuck in a very tall building when something bad happens. A side note: This will not be the right film for anyone who still cannot watch people trapped by fire on the upper floors of a tall building as part of a fun action movie. Which is not an unreasonable position to take. But. But. Should you decide to go on this journey, let me tell you precisely what I told the publicist at the screening after I saw it, in these words: It's extremely stupid, but a lot of fun. This is a movie to see with a raucous crowd that quickly reaches a tacit agreement that laughing and talking back are both permitted, where you can make a loud "HA!" noise when something particularly offensive to the laws of physics happens. (You and this crowd will be grading physical realism on a steep curve.) It is better with people who can respond to a line meant to be inspiring and gritty with a hearty "Are you serious? ", as the woman next to me did. It is better with people who will determinedly applaud every time The Rock doesn't die. This is a movie where you want to be sitting next to the "Awwww, [profanity]!" lady. Which I was. One of the things that's often forgotten in blockbusters is that there's a difference between an action movie and a slaughter movie. For example, one of the reasons the White-House-is-down movie Olympus Has Fallen is so bad (so, so bad) is that it's not an action movie — it's a slaughter movie. It has an enormous body count, with so many innocent people mowed down that they become meaningless and fungible, perceptible only in groups, and that makes up far too much of the alleged "action." What makes Die Hard a great action movie is that the violence is specific in just about every case, and the killing of innocent people is limited. The most gruesome murder happens precisely so that the stakes can be raised, and the mercilessness of the thieves revealed, without 50 people being killed with machine guns. Skyscraper winds up somewhere in the middle. There's one sequence that tips over into being gratuitously violent to the point where it was distracting, but for the most part, the film doesn't use killings of innocent people just to create tension. The action is what action can be when it's goofy and unfettered by reality: the running, the climbing, the jumping, the swinging, the hanging by one finger. A good action movie doesn't really need a lot of killing if it has enough avoiding-being-killed. The clever narrow escape, after all, will always be more exciting than just shooting your way out. The stakes come primarily from the presence of Will's family, including Neve Campbell, whom I haven't seen much of lately (she's been spending some time on House Of Cards), but who's solid here as Tough Mom who plays a significant role in saving herself and her kids, even if she's firmly the second banana to the first Rock. She's bringing warmth but also competence, and the role she plays in the third act, while predictable, is appreciated. About that Rock: Dwayne Johnson is a charismatic actor. Not necessarily a great actor, but one who generates so much screen interest just by being there that he can get away with a lot. Here, they've wisely given him a physical vulnerability that can theoretically be exploited: Will had his lower leg amputated after a previous injury and wears a prosthetic leg. Let us grant: it would be a far more interesting entry into the action pantheon to have an actor with a prosthetic limb playing a character with one. It would also be a welcome boon to actors who use prosthetics. But this doesn't seem like a film where the alternative was to cast an actor who's an amputee; it seems like a film where the alternative was probably The Rock without the prosthetic. (Writer-director Rawson Marshall Thurber previously worked with Dwayne Johnson in the 2016 action-comedy Central Intelligence.) The Rock is the mass at the center of this film, even more than the skyscraper. From a story perspective, the prosthetic plays the same role in Skyscraper that Bruce Willis' bare feet do in Die Hard: it presents some additional challenges, but nothing an action hero can't handle. And, to the film's credit, the leg comes into play in some creative, surprising, and even witty ways. (Really.) If you're going to make this move and do it as respectfully as you can with this actor in the role, it can't be a distasteful sympathy play; it has to be an action play in keeping with the rest of the film. And here, it is. Look: There's barely a beat here, storywise, that will surprise anyone. The bad guy is completely disposable (I had to look up that his name is Bota and he's played by Roland Møller; I remembered only that he was evil and was after a Precious Thingy). There is inventiveness in the action and sometimes in the direction, although there is also at least one fight in an enclosed space that's edited in that very irritating way where it becomes impossible to tell what's going on. But I cheered — internally or externally — several times. Not cheering like "YAAAAY! ", but cheering like, "JUN-GLE! JUN-GLE!" or "LAD-DER! LAD-DER!" It's so stupid. It's really stupid. But it's a good time. On a hot day, in a cool theater, with some friends and a beverage and some precious free hours to let everything important go? Yes. Yes, it's recommended.